finalizes Hunter's Point power plant closure. The long maligned Hunters Point Power Plant goes dark Monday as PG&E officials turn the switch that shuts it down. Closure was a long time in the making. For years, neighborhood activists leveled charges that plant air pollution contributed to soaring rates of asthma in the Bayview-Hunters Point district. And heavily regulated PG&E was more than eager to jump through years-long hoops necessary to close the facility, PG&E staff involved in the process told the Sentinel yesterday. It had reached the end of its useful life but the regulatory process took from 1999 until 11 o'clock bright Monday morning, recalled Kevin Dasso. Dasso serves as senior director of PG&E's asset investment planning division. A stakeholder group was formed in 1999 to meet requirements of the California Independent System Operator (ISO) as a prelude to shut down. "It included various City departments as well as merchant generators," said Dasso. "We had all kinds of players that were interested in the reliable electric service to San Francisco." Final result of that stakeholder planning process opened as the Jefferson-Martin transmission line on April 26 this year, delivering almost twice the power with promise of increased reliability over the Hunters Point Power Plant. 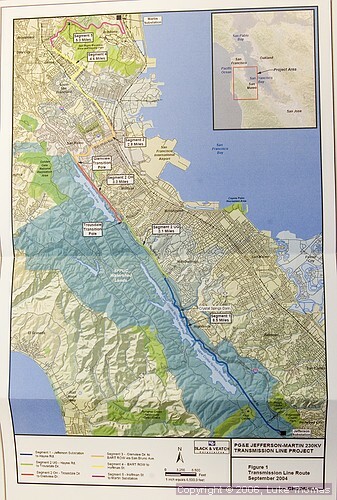 The new line runs 27 miles into San Mateo County, with three miles overhead and the remaining 24 miles underground. It is the largest 230kV underground power project in the United States to date. The line starts just north of Woodside, runs through San Mateo County roads, the Town of Hillsborough, the Cities of Burlingame, San Bruno, South San Francisco, Colma, Daly City, and ends in Brisbane. It delivers 4000 megawatts. Each 1000 megawatts carry electricity sufficient to power 800 households. Expanding reliability was at the heart of early planning. "During those times, it seems like such a long time ago, but that was really at the height of the dot.com expansion and we were seeing load growth rates in San Francisco and northern San Mateo County probably at three or four times we see today," Dasso continued. "We were looking at how to go about meeting the long-term transmission needs for the area. "There was an agreement in place at the time to close Hunters Point Power Plant. 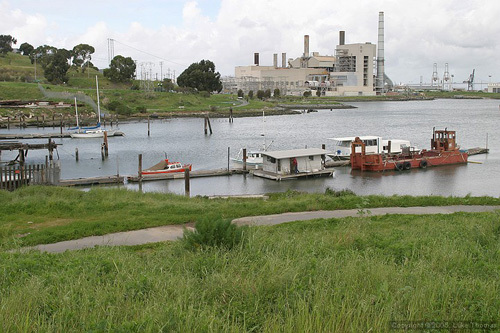 Hunters Point was an aging power plant. "Even if we didn't have the agreement to close the plant it was reaching near the end of its life and we needed to figure out what to do about it." "The San Francisco peninsula for many years, actually since electric service began, has been served by lines that come up the peninsula," noted Dasso. "All that transmission comes from a single substation in the San Mateo area. "One of the goals of this longer term San Francisco study group was to look for alternative feeds so that we have multiple sources resulting in improved reliability for the whole peninsula. "About a year-and-a-half into that process we identified the preference for the project which ultimately became known as the Jefferson-Martin project." Other routes were considered before consensus chose the Jefferson-Martin project, said Alain Billot. 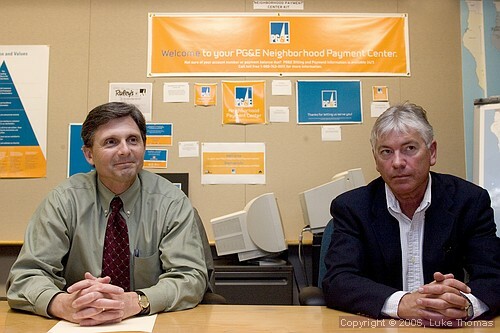 Billot acts as principal project manager for PG&E's San Francisco reliability department. "We had looked at other alternatives such as coming from the East Bay and crossing the Bay in a submarine configuration or through the BART tunnel. Or a second line from San Mateo," stated Billot. "This (Jefferson-Martin) alternative was definitely the winner." It was proposed to the ISO which granted initial approval in 2002. Next came environmental impact studies. "What happens is PG&E prepares a Proponent Environmental Assessment (PEA) and that's an environmental study of alternative routes and what we think is best from a biological and community environmental and economic standpoint," Billot explained. "Once that is prepared then it's turned over to the California Public Utilities Commission (CPUC) and the CPUC has their environmental consultants prepare an Environmental Impact Report (EIR). "That pretty much kick-starts the California Environmental Quality Act process (CEQA) process." A Certificate of Public Convenience and Necessity was required to be issued by the CPUC, due to size of the project, which followed CPUC assurance CEQA provisions are met. Public hearings and an evidentiary hearing began drawing input of the public as well as Federal, State and City agencies participation. Eight public hearings were held and 12 public agencies or cities participated in the evidentiary hearing. Initially scheduled as a five-day hearing, the hearing went on for five weeks. By 2004, the project was approved to proceed but it took more than simply building the Jefferson-Martin line. "At peak, approximately 400 workers were on site with 30 environmental and biological monitors watching the five construction operations on the Peninsula streets and in the San Francisco Watershed" when construction finally began, reported Billot. Several other projects were required in addition to the Jefferson-Martin project to allow for the closure of Hunters Point. These projects included upgrading transmission line conductor capacity, installation of the Potrero Static Compensator, San Mateo-Martin No 4 Line conversion, installation of a new Ravenswood transformer, San Francisco internal cable higher emergency rating, Telsa-Newark No. 2 Line reconductoring, Ravenswood-Ames line reinforcement, and San Mateo bus insulator replacement. For the Jefferson-Martin alone, Billot estimated PG&E staff and consultants preparation costs at $12.5 million, and a forecast at completion of $218 million. "It took close to one million hours to install the duct bank and pull and splice the cable with less that a handful of minor accident and virtually zero community complaints," added Billot. The effort and investment culminates Monday as all involved kiss the Hunters Point Power Plant goodbye with happy a flick of a switch.